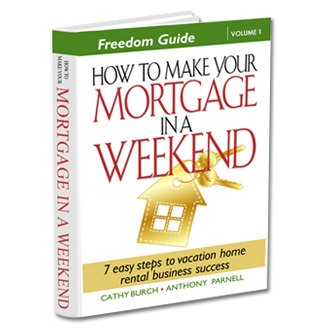 The How To Make Your Mortgage in a Weekend is a how to guide that has taught and changed the lives of many with its common sense approach and simple step by step instruction to establishing a successful vacation home rental business. Its unique approach gives receivers the positive motivating factors and establishes a mindset of victorious business prosperity. It is saving people from foreclose, generating positive cash flow for homeowners, and most importantly giving them the tools they need to get their business established which allows their home to work for them. Being a victim of a house poor situation can be mentally challenging and taxing. Deprivation is not what the dream of home ownership is about. Not having enough income to stay afloat and living pay check to pay check is no one’s idea situation. The How To Make Your Mortgage in a Weekend Program has solved this issue for many. The book takes our owner community on an energetic journey that moves homeowners into action, out of financial hardship and mastering the steps that lead down the road to financial recovery and financial freedom. The programs 7 easy steps will have you think bigger, think outside your circumstance, visualize your promise and literally walk you step by step down a fast track road to a positive income. The program has been successful for people from all walks of life. It is like a glove that expands to fit all sizes and circumstances. The common thread is that owners have gotten results in a short period of time. The program with work for you, no matter if you are thinking about buying a home and want to know how to maximize your future investment, trying to maintain and retain your piece of the Dream of Home ownership with a Right Now Solution, or developing an investment opportunity that will quickly maximize your ROI. This comprehensive program has covered all of the key factors for success. Our owner community has some of the most powerful success stories in the industry. They are true and powerful testimonies of people that fought defeat and despair to embrace victory by taking the first step and indulging into a victorious mindset by utilizing our program. The formula is here for the taking and the keys to Success is here for you to use to open your personal doorway to your road to financial peace of mind. How to make your mortgage in a weekend will give you the key to experience what many have, and allow you to receive your promise.